I bought my car CPO and I love the specs on my car. I really liked having the carbon MF wheel match my interior. My 991S is a cab, so the heated wheel is a must. But I hated the shifters (never made sense to me), so I got the Techart Paddle shifters. 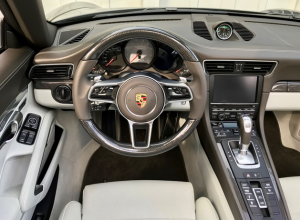 After spending all the $$ I really wanted to believe that I was going to be happy with those Techart shifters, but truth is – those shifters were flimsy, and also obstructed the dashboard view. They just didn’t feel and look right and they weren’t from the Porsche factory. 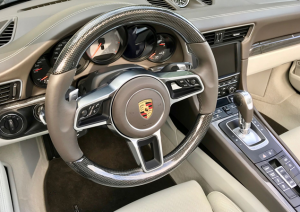 So I was excited to see the first 991.2 steering wheel retrofits being posted. Of course, MF was a no go at first. The perfect steering wheel for my car is actually a Macan steering wheel. So I bought it new with a new airbag. I also bought the retrofit kit from Yuan Li. I actually thought to myself this isn’t going to work. Yesterday I did the retrofit. Beginning to finish in exactly two hours. 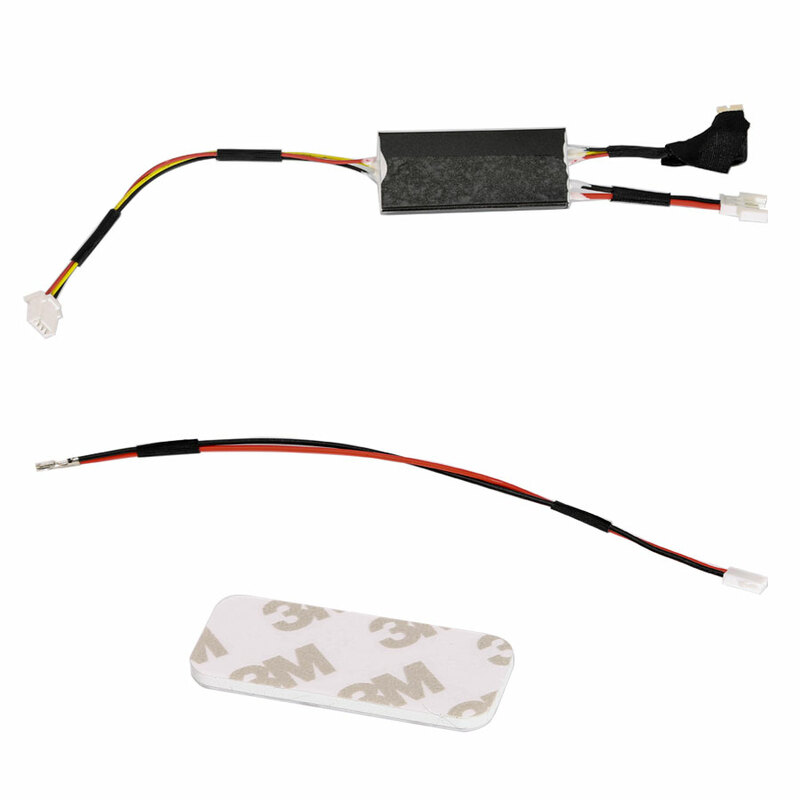 I am experienced in electronic engineering and have a lot of soldering experience which you need if you have a heated wheel. You need to remove an SMD resistor and swap another one out on a tiny circuit board. Throughout working on the new steering wheel, I was very nervous. But after installing the conversion module into the Macan wheel, and finally swapping steering wheels, everything worked just perfectly!!! It is just amazing to me that it all worked out. I absolutely love the new look – it actually feels like I have a new car. The MF controls are much improved (very precise), the paddles are absolutely perfect. It really is a dream come through for me. I posted some before / after pictures. Also a video that shows that all buttons work properly, included backlight function, and the steering wheel heat. I do think my 991.1 SD wheel feels a bit dated in comparison to the newer ones. 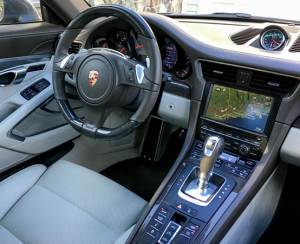 Question – I don’t care about the multifunction as much as my desire for a heated steering wheel. Can this be easily added? Also – if you don’t mind, what was your total cost? 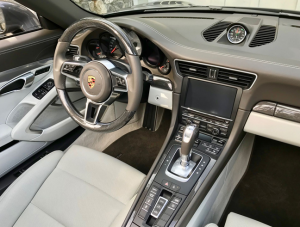 Answer: Adding heat will at a minimum require a different clock spring, but I am not sure if you can get the 911.2 wheel with heat and without multifunction without modifying the steering wheel. Question 2: is it easily reversible back to the original steering wheel in case you wanted to resell with original parts in the future? Answer: Yes and no, depending on your definition of “easily” reversible. With the exception of the switch that controls the steering wheel heat, everything else is plug and play – mostly rerouting wires and plugging them into the adapter. The heat switch circuit board in the steering wheel requires minor soldering (change of resistors) but that can be reversed too. Question 3: The newer wheel has a different feel to the paddles. Less travel and more of a mouse click than the old one. Does this add to the experience vs an older SD wheel paddle shift? My hypothesis is that this has more impact to reviews than the software. Answer: I don’t have experience with the SD wheel. It’s a day and night difference compared to the Techart paddles. To me the shifters on the new wheel are absolutely perfect, and really the main reason I did the swap. Second reason being optics, and third reason just wanting to mod the car to make it mine. Question 4: It looks amazing! I would be very interested in a similar upgrade. I have no idea what a standard leather steering wheel would cost. Time to call the dealer. Question 5: Can a MF wheel be added to a non MF wheel? Can a harness be added to activate multifunction? How about the Sport/Sport Plus ****, can that be retrofitted also? Original with sport style steering wheel car upgrade multifunction steering wheel,need coding the vehicle from sport style wheel to multifunction by PIWIS.Based several retrofit 991.1 to 991.2 wheel projects,no need purchase “multifunction enable code” for 991.1,MF can works. Question 6: Is it the same size wheel as the 911 wheel? Answer: Yes, exactly the same size as the old MF wheel. This entry was posted on August 18, 2017, in Other car accessories tools and tagged Other car accessories tools. Bookmark the permalink.